With 13 all-glass elements in 10 groups, the Fujinon XC 50-230mm f4.5-6.7 OIS II lens delivers advanced optical performance across its focal range to produce clear, sharp images. The lightweight focusing lens and high-precision motor guarantee quick and silent autofocusing, whilst the optical stabilisation reduces camera shake during hand-held shooting. 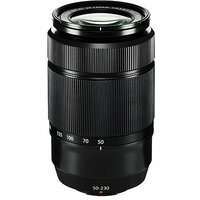 The zoom range of the Fujifilm 50-230mm f4.5-6.7 OIS II XC Lens begins at 76mm and goes to 350mm in 35mm format equivalent, making this a lens suitable for every day, all-purpose shooting.